We forgot about these. 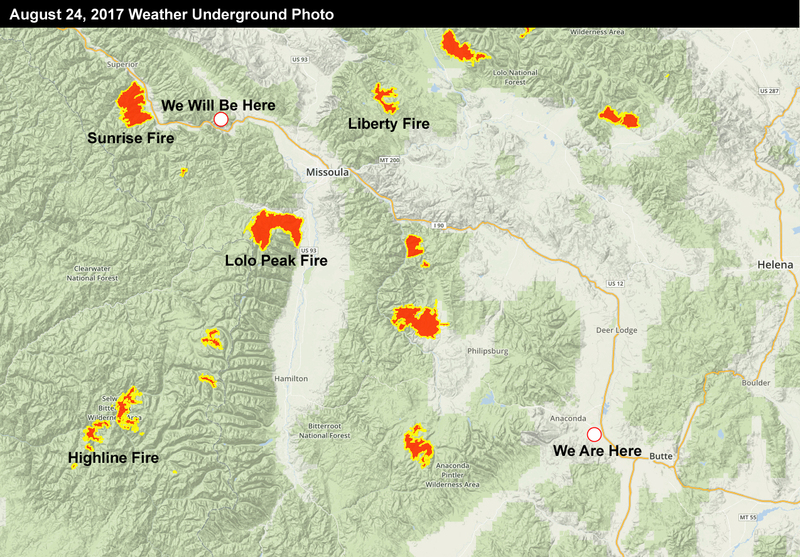 When we worked at a campground in Bishop, CA, we experienced several wildfires near us. One of them created smoke that we originally thought was fog. About mid-way through Montana while driving on Interstate 94, we noticed haze in the distance on the horizon. We thought it was pollution at first. However, when we arrived at our current campground near Anaconda, MT, the smell was unmistakeable — something was burning. Besides the smell, we’ve been noticing how dry Montana is. The ground looks like straw . . .
Luckily, we’re only in the path of the smoke from these fires. On Friday we’re on our way again to a spot up the road from Missoula. Here are some photos from our current campground . . .
We met Micky, a retire nurse, full timing in a small casita. 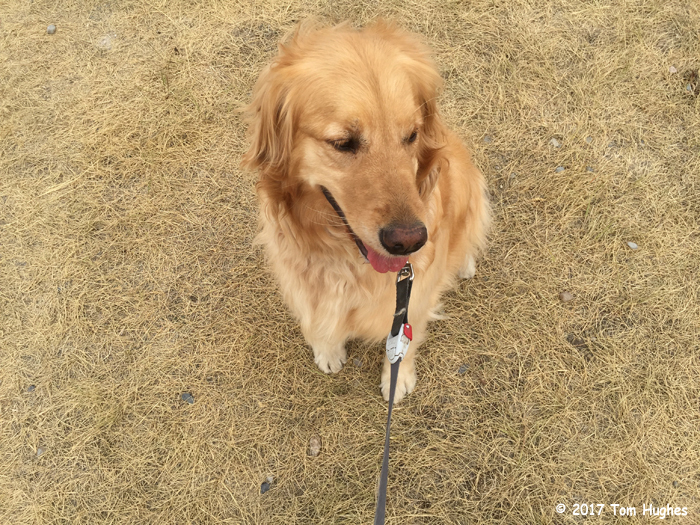 Her blog is here — Wandering Spirit. 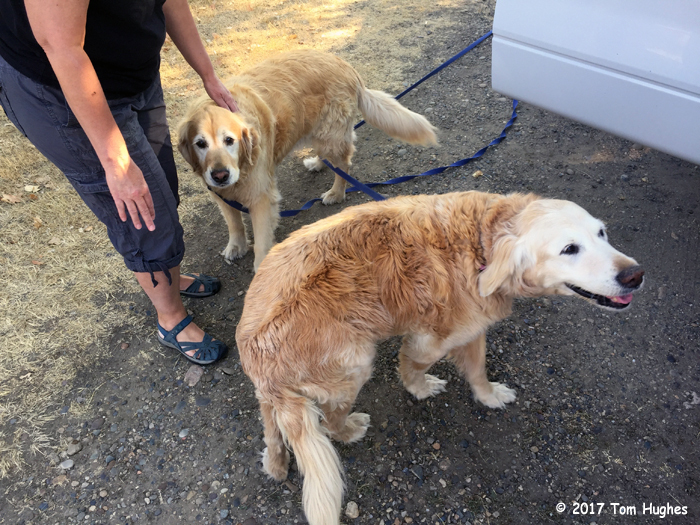 She is traveling with two beautiful Golden Retrievers — 11-year-old Shiloh and 14-year-old Joy . 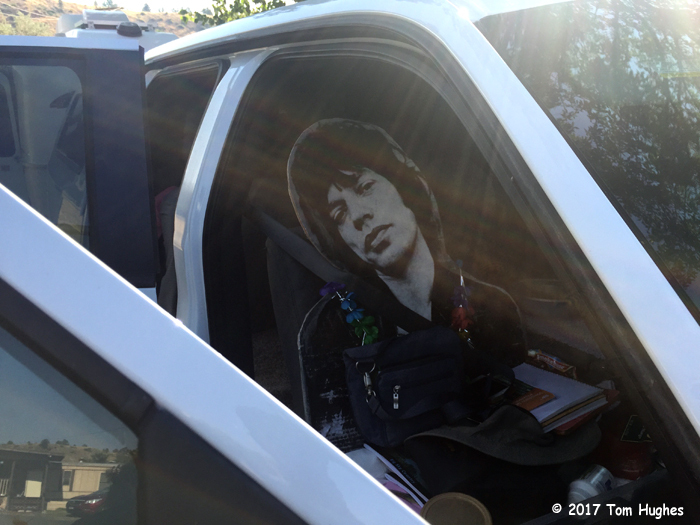 . .
Micky was also traveling with a cardboard cutout of Mick Jagger . . .
← Go South, young man! GAAAAA.. do you have to go to that next place that is sooo close to the Sunrise fire? It RAINED last night. We can see some blue sky today! We are watching this carefully. We are in Bozeman not far behind you, seeing the same haze and smoke. We are far enough away that we do not smell it yet. I’m sure that’s going to change when we head north to the Glacier Park area. As we get north of the Great Falls area, I am expecting it to begin to clear.